2012 marks the 700thanniversary of the birth of Edward III at Windsor Castle. Born here on 13 November 1312, the first son of Edward II and Isabella of France, Edward III became King of England at the age of fourteen, in January 1327, on the abdication of his father. His reign, lasting fifty years, was dominated by war with Scotland and France, which has led to him being chiefly remembered as a warrior. However, it also saw great building projects, the evolution of the English parliament, the establishment of English as the official language and the longest period of domestic peace in Medieval England. 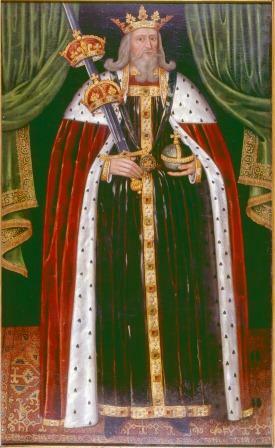 Edward III had a long and close relationship with Windsor. Having been born in the Castle, he was baptised here on 16 November 1312, in St Edward’s Chapel, built by his ancestor Henry III in around 1240 and subsequently rededicated by Edward III to St Mary the Virgin, St George the Martyr and St Edward the Confessor. Several of his children were born at Windsor, and it was here that his Queen Consort, Philippa, died in 1369. 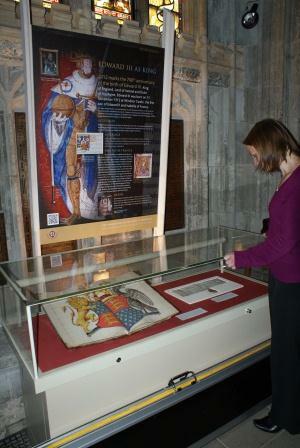 In commemoration of the 700th anniversary of Edward III’s birth at Windsor, an exhibition of documents, rare books and artefacts from the St Georges Chapel Archives and Chapter Library will be on display in the South Quire Aisle of the Chapel from 19 June 2012 to 3 January 2013. The four exhibition cases and explanatory panels will cover the following themes – Edward III as King; Edward III and Windsor; Edward III and St George’s Chapel; and Edward III and the Order of the Garter. Together they will illustrate key aspects of the life of this great English King and explore his relationship with Windsor, which he was to make the spiritual home of his new chivalric order, the Order of the Garter, founded here in or shortly before 1348. The exhibition will be open Monday to Saturday from 10am to 4pm when the Chapel is open to visitors. Windsor Castle admission charges apply. (The exhibition will be closed on Wednesday 3 October 2012).